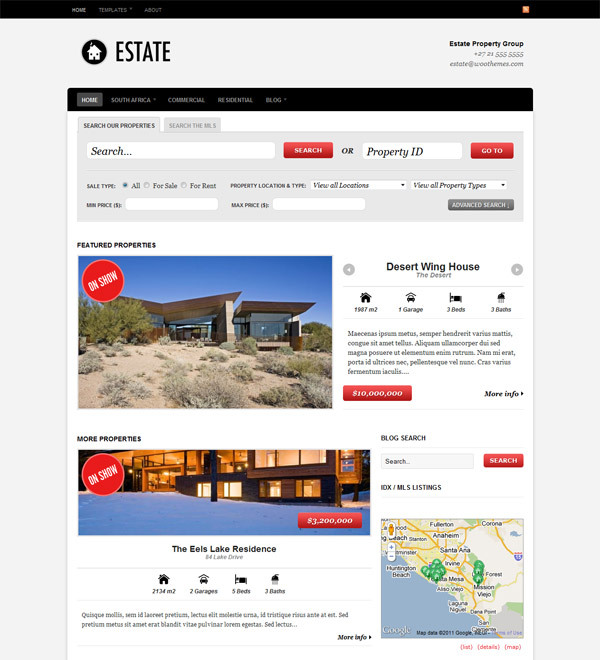 Estate is a hugely powerful, yet simple to manage business “theme” built specifically for real estate agencies. Built on a strong framework it boasts advanced SEO control, clean code and styling modification features. Making use of WordPress 3.0’s custom post types and taxonomies the theme unleashes a new “Properties” management facility when installed – proving it’s far more than just a WordPress theme, it’s a web solution. With flexible page templates, an advanced search facility that allows you to drill down into properties based on very specific criteria, Google Maps integration and smart property images management you’ll find huge value in the modest price tag. Now the theme also comes with IDX functionality thanks to dsIDXpress plugin integration. The theme can search all the property listings based on any combination of it’s location, property type, price, number of bedrooms, to name but a few. The home page scroller can feature any noteworthy property listings you wish to highlight in the most prominent home page space. Simply add a tag to the featured posts to enable them in the scroller. You are used to seeing blog posts and pages in your typical WordPress installation. Estate enables a whole new post type – properties, with custom entry fields to populate it’s property listing. Choose whether you want a widgetized sidebar on the home and other page. Intelligent page templates determine if you have included a virtual tour, Google Map or property images and adjusts the listing layout accordingly. On Show properties get prominent styling, and all the “On Show” properties can be viewed on their own unique archive page template. Associate a Google Map address to your property listing and enable street view and location maps allowing your site visitors to browse the neighborhood. Making simple changes without editing code, like adding your own logo, changing to an alternate color style, adding Google Analytics code, couldn’t be easier with the theme’s backend options panel. The theme is tested to ensure it is compatible with all the modern web browsers like Firefox, Safari, Chrome and Internet Explorer. An image resizer script is built into the theme framework that automatically scales your post images for pixel perfect display in the template. No need to upload new cropped images when re-designing your website. It also comes packaged with a .po file for easy WordPress theme translations into your desired language – editing one neat little file without hunting down text in all our theme templates.